Download and install Molcart files. The MolCart package is a self-extracting executable file. 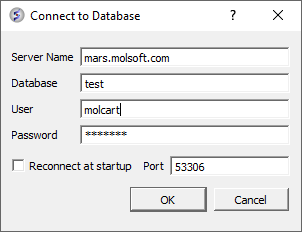 Download the MolCart file ( molcart-version-platform.sh ) from the Molsoft website. You will now be prompted for a password. Select which default databases you wish to install. MolCart is now fully installed. 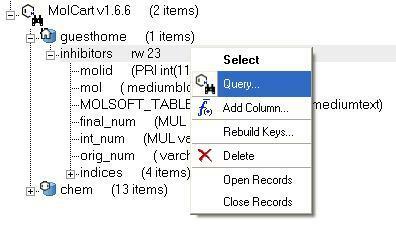 Once you have activated MolCart the loaded databases and users will be shown in the ICM Workspace as shown below. All the records and fields contained within each database can be viewed by expanding the tree structure in the ICM Workspace. Right click on the database where you wish to add the file. To begin processing your query first you need to decide which database to search. The options are listed in the "Data Source" section of the ICM chemical search window. You can either search a local table (molecular table) or you can search MolCart. 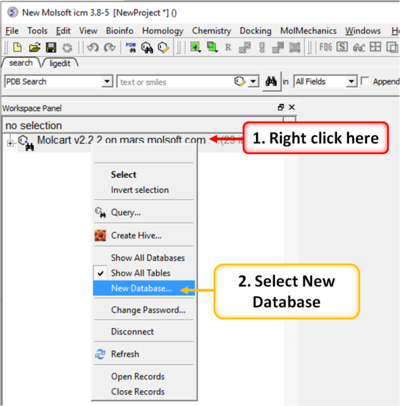 If you select MolCart you first need to setup the link to the correct database - described earlier. Click on the button shown above (yellow pencil) and the Connect to Molcart window will be displayed as shown below. See the Chemical Search section of this manual on the many different search procedures. 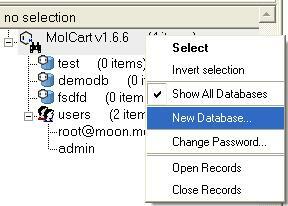 To perform a text search on one of the databases contained within Molcart you first need to index the text within the database and then search using the query option. Expand the tree of the database in the ICM Workspace. Select the column headers you wish to search which contain Full Text or Partial Text(the data type for each column is listed next to the column name). Multiple column headers can be selected by clicking and holding down the CTRL key. A range of column headers can be selected by holding down the shift key and clicking to select. Next, right click and select Create Index. Select 'Full Text' and you will notice an additional header in the ICM Workspace called 'indices'. The value in the items category represents the number of columns you have chosen to text search. Right click on the database name in the ICM Workspace. Select 'Query' as shown below. 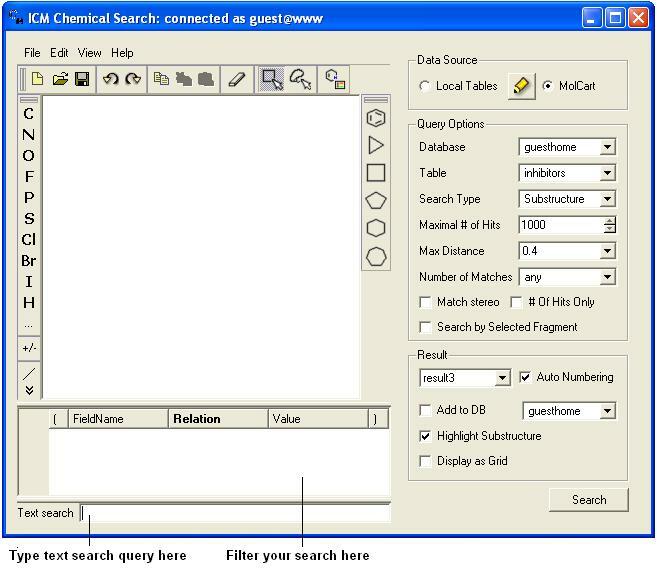 The ICM Chemical Search query window will be displayed as shown below. Type your query text in the space provided and hit the enter key or click on the search button. Right click in the box shown below and select 'Add Condition'. You can add as many conditions as you like. To remove a condition, right click on the filter and select 'Remove Filter'. 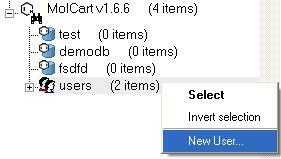 Right click on the MolCart header in the ICM Workspace and select Change Password. 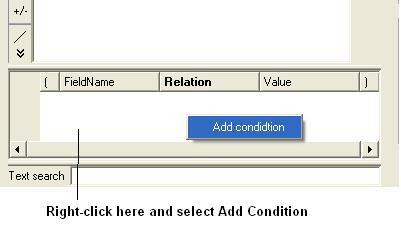 Right click on the User Section of MolCart in the ICM Workspace as shown below. Select the New User Option. Add new username and password in the data entry box. New user will be displayed in the ICM Workspace. Right click on the user in the ICM Workspace. Select Edit Privileges and a data entry box as shown below will be displayed. Edit the privileges by checking or unchecking the appropriate boxes. 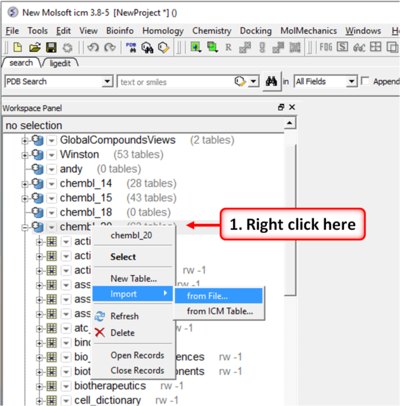 Right click on the MolCart Header in the ICM Workspace as shown below. Select the New Database option. Enter a unique name for your new database. The new database name will appear in the ICM Workspace. Now you need to add data to your new database (See Instructions Below). 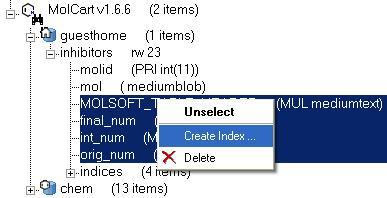 Right click on the database name in the ICM Workspace as shown below. Select either Import from SD file or Import from ICM table. 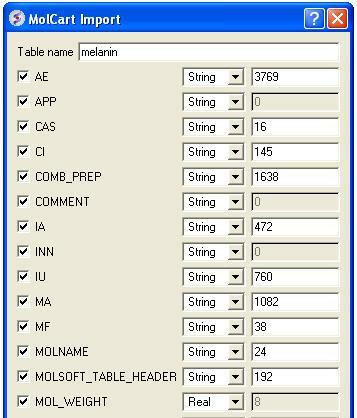 Select the appropriate file and the records structure of your sdf or ICM table will be displayed as shown below. The database name can be changed at this point and the fields contained within the database can be altered. Certain fields can be excluded by checking the boxes - this will help in minimizing the size of a database. Caution must be taken if you want to change the field type or length. Click OK and your sdf file or ICM table will be added to the database. This can be seen by expanding the tree structure in the ICM Workspace. Right click on either the database or user in the ICM Workspace.